It’s time to be thinking about reading through the Bible in 2009 — a great habit to start if you haven’t already. 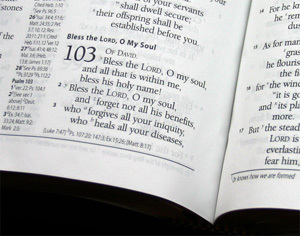 The ESV.org site has several one-year Bible reading plans to choose from. Most of them can be downloaded as a PDF file and all of them can be subscribed to by Email, RSS, read online in your web browser or read on your mobile device. My favorite plan is the M’Cheyne One-Year Reading Plan which will take you through the Old Testament once and the New Testament twice.